Sublime. The sweetest voice we ever heard whispered to our soul. Lenny is kind, courteous and funny. Good evening friends, shall we start it? We cheer and clap and hoot. I’m seventy-three now, he says. The last time I played in Dublin, I was sixty. Just a kid with a crazy dream. 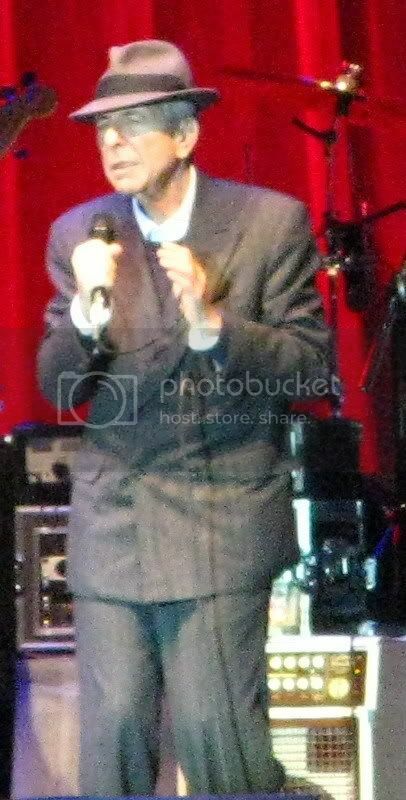 He wears a snappy fedora which he removes in thanks after each song, and holds to his breast as he bows. He’s grateful, he tells us, for the warm welcome, and we believe him. He calls us, my friends, and I think he means it. His voice has become a rich, smooth bass-baritone, and he uses it like another instrument of the small orchestra he has about him. His band are, as always, superb, and he’s accompanied by his friend and collaborator, Sharon Robinson, and by the Webb sisters: an impossibly perfect singing duo who spend the entire evening weaving diaphanous close harmonies around Leonard’s heartfelt growl. When the girls open with the familiar syncopated lilting start of Dance Me, from his mid-period masterpiece Various Positions, we know this is going to be a journey through Cohen’s huge labyrinth of poetic songmaking. This is going to be no self-indulgent old man’s last monument to his own decline. This is going to be Cohen celebrating a lifetime of creating. The crowd sways with his melody and sings along with his poetry. We’re already under his spell and he hasn’t been up there five minutes. As the light slowly fails, he continues with The Future. And then, before we can draw breath, There Ain’t No Cure For Love, belted out by the three girls, as Rafael Gayol pounds the drums beneath Roscoe Beck’s respectful double bass rhythm while Dino Soldo’s sax cuts through the evening air like a razor blade. there’s gonna be a meter on your bed that will disclose what everybody knows. 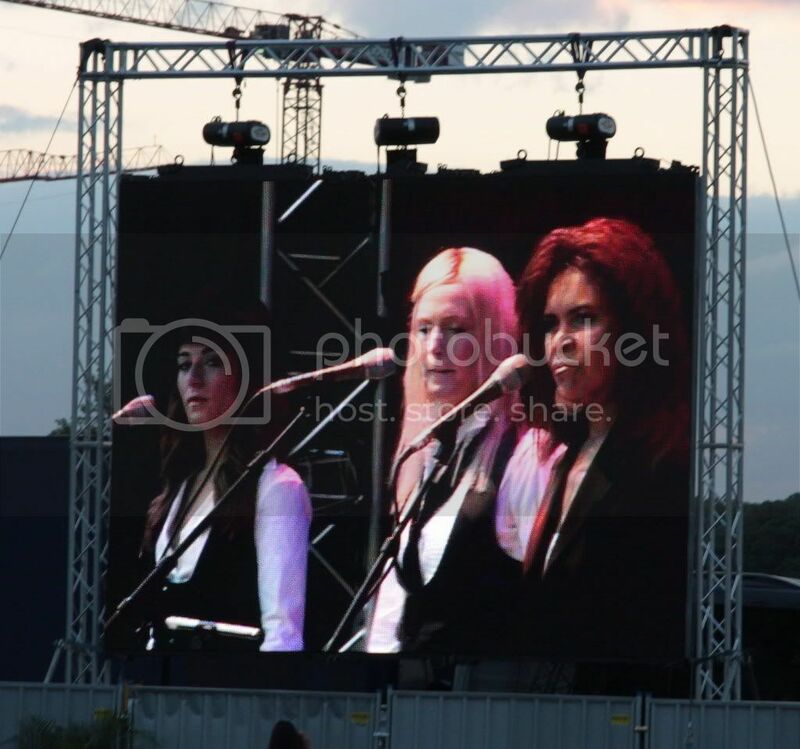 … and the Webb sisters’ heartbreaking twin voices catch the mood, raising our hearts into the dying sunset. As we recover, here comes Who By Fire, Cohen’s marvellous adaptation of an ancient Jewish prayer, and he closes on Heart with No Companion. Friends, he says, I am truly privileged by the warmth of your welcome. Privileged? I’m grateful that I could be here, on a night of enchantment, in the presence of this humble giant. Lenny, I want to tell him, I came to you as a pilgrim when you played here twenty years ago, and you’re an even bigger man now than you were then. I read that somebody on Friday night shouted Don’t leave it another twenty years, and Lenny replied, I don’t have twenty years. He doesn’t appear to mind. Lenny seems to be at peace, happy and content. Amazingly, there are people who think this man lacks humour. Then he pulls out the inevitable crowd-pleaser for the oldies: Suzanne. Hard to blame him, I suppose. There are bills to be paid. Some people here don’t seem to realise he recorded anything after 1967, and when later he sings I fought against the bottle, but I had to do it drunk, large chunks of the crowd laugh like they never heard such a funny joke. Did you hear that? Did you hear what he said? These are the Cardigan People, the ones walking around with plates of sushi. I banish them from my thoughts. The set continues with Gypsy Wife from Recent Songs, an album I never really warmed to, though this is a fine version of the song. After that, it’s Boogie Street, from Ten New Songs, released when he left the Zen monastery and discovered he’d been ripped off and all his money was gone. What would flatten you and me fazes Lenny not the slightest. He takes it in true Zen style, as an opportunity, and when I look up at him now, radiant, smiling and happy, perhaps that’s just what it was. I’m one of those people who don’t like Jeff Buckley’s version of Hallelujah, and so I’m a bit disappointed when that’s what he sings, but hey, it’s his song, and he can do whatever he wants with it. After all, what did this beauty in the moonlight do? He’s only getting into his stride. Democracy is coming to the USA, Leonard growls, and everybody cheers. But when he says If you want a doctor, I’ll examine every precious inch of you, 6000 women pass clean away and have to be revived with smelling salts. Lenny is 73, damn him! It’s just not right. Without giving them a chance to recover, he begins A Thousand Kisses Deep as a spoken poem, and gradually lets the Webb sisters elaborate on his deep, rumbling, bell-clear voice. Before we know it, with a bow and a sweep of the fedora, he’s gone. Thank you my friends. Thank you so much. We trust Lenny won’t let us down, and our faith is well placed. Here he comes, with a bow,and a smile. You’re far too kind, my friends. Too kind. Now that they’re all in the mood, the time is opportune for Take This Waltz, and as always, Lenny makes appropriate obeisance to Federico Garcia Lorca for writing the original lyrics in Spanish. The crowd are dancing. Some people are crying. People are cheering. People are hugging each other. Perhaps he follows that with Marianne, but I’m not absolutely certain. It’s been a long show and I’m not a young man any more. I’m also not entirely sober, which doesn’t help, but at least I’m not eating sushi. Then the band powers into a rocking version of First We Take Manhattan. A few years back, Dave Fanning asked him what would happen when he took Berlin, and Leonard, in his usual laconic way, took a puff of his cigarette before answering. I’m not at liberty to disclose the full details, but I can tell you it will involve a lot of new parking meters. As the crowd dance and cheer, he’s gone again, doffing his fedora, but he’s back in a second, and now he’s doing That Don’t Make it Junk. The three women’s voices soar above the crowd, into the darkened sky, as the cello and the guitars curl themselves around Cohen’s rich and smoky croon. A lone seagull wheels above him in the darkening sky as Lenny drops the emotional gear another level with a slow and bluesy rendition of If It Be Your Will. Reciting the first few lines, he again invites the Webb sisters to unfold it and the girls’ intertwined voices fly towards a Heaven of Leonard’s creation. Dear God! Nobody is bulletproof. The whole crowd are transfixed and filled with adoration. How is he going to wrap it up? Of course. What else? And they are. They’re dancing and drinking, and the band is pumping it out. but the boss don’t like these dizzy heights. The band all stand up. They wish us out with an a capella version of I Tried To Leave You, and we’re standing there, bereft. Is this the last we’ll see of Lenny? The old maestro has one final trick up his sleeve. You had a vote on Europe during the week. Congratulations to you Ireland. Still bewildering the world. Lenny’s moving towards the wings, slowly disappearing in the folds of the curtains like an old showboat slipping beneath the waves. With another smile, another bow and a wave of the fedora, he’s gone for good. here are some video clips from Dublin posted on youtube. I know the quality is a bit patchy, but it might give you a feeling for the night. how did he sound? what did he sing? I’m so jealous of all you lucky people who got to go to the concert. It sounds amazing, lucky lucky peoples. Snookertony: The report is up now. I just threw in the few pics earlier to keep you going. A million thanks for this, Bock. This is the closest I’ll get to this tour but you’ve described it in such a way with the play list too (fab -thanks! ), that I can get a sense of the night. I dearly, dearly wish I could have seen him. I would have been a melter for sure at I’m Your Man. The play-list was spot on, a great mixture. “Bird On A Wire was the first Cohen song I ever heard, lying under the coffee table and listening to my mother’s scratchy old Songs From A Room LP. “Like a baby still-born, like a beast with his horn, I have torn everyone who reached out for me.” At 11 or whatever i was, I had never heard anything like that. Or anything so savagely, sacredly, secularly(!) Old Testament as that album. Despite common sense to the contrary, I thought I must be the only person in the world to have discovered Leonard Cohen. Incredible, life-changing words and music, warm and warped and wise and witty – exquisitely wise and witty, on a way that makes all your nerve-endings and all your neurons fire at one, it seems – I wish that was more well known because it would make him more approachable for those who think he’s all about gloom. Thanks for this post, Bock, and the pictures. It’s a real treat to see them and hear about it all from another ardent fan. I wish more men would wear fedoras. The first time I hitched around Europe it was with his excellent novel ‘The Favourite Game’ of 1963. I still have that dog eared copy and it still reads as fresh today. Sam has said it all, but again thanks for this Bock. 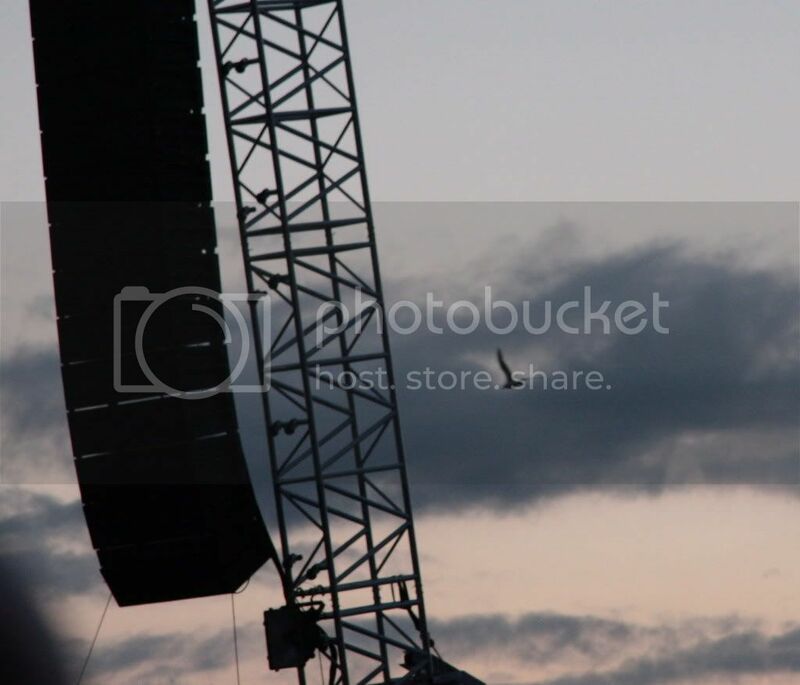 And your second last photo is one of the best shots of a gig I’ve seen, it catches the mood and the falling light brilliantly. it was perfect night. My dad passed away last year and he was the one who introduce me to his music. I thought that i will be really upset and thinking about my dad because he loved leonard music. It was really emotional for me and my mum but we both agreed it was amazing. I alwaysed loved his music. This is very good Bock, really enjoyed reading it. Write more about people and stuff you like. Bock, your review/account of the concert is a mini work of art in itself. I was there and you caught the essence of the night perfectly. We were taken to a higher plane of existance and kept there for a couple of hours by a man still at the top of his game in his 70’s. There was a sustained emotional charge that varied from close to tears to wild laughter and various places between and beyond which made this much more than a concert. Agreed. Fantastic post. Well done sir, well done indeed. I thought he did, but it was a long show and my scribbles aren’t 100% reliable at these things, but it’s important to get it right. I have at least three versions of different parts of the evening scribbled on three different envelopes and cigarette boxes. That’s me: organised to the last detail. (We had a number of scoops in Murrays before the gig, and while we were avoiding Damien F Rice, though of course, I know that’s no excuse). Come back to me if you can establish exactly the sequence. What night were you there? I was there on Saturday. I presume you were too from the rest of your account of the night. I can’t imagine he did the ” …just a crazy kid with a dream…” gag and ” Ireland continuing to bewilder the world” exactly the same way both nights. Not that it really matters. A concert this good is all about mood. Anyway someone else will weigh in here who had less to drink than you or me. I was there Saturday too. As you say, the mood is important, but the details matter too. Did I just imagine he sang Marianne? Thats it ask the audience. Superb, atmosphere-laden post, Bock. I’ve given up trying to convey a sense of what the evening was like, and saying you had to be there is pure provocation to the hard-done-by. So now I just direct all queries to your post. What I find hardest to explain is that this was not a night of nostalgia. I love what his changing voice has added to his back catalogue – everything old is new again, and the (relatively) new has the wisdom of the ancients. I was there on Saturday and Sunday night: don’t remember hearing Marianne on Sat but did hear it on Sun. Even in the rain on Sun it was magic! Your run down takes me back to the three hours with Leonard – I have been down and out since the concert and today I played his album and I am lifted again – mentally and spiritually. What a great wise endearing lovely man he is and his voice has just got more sexier by the year. I saw him in the National Concert Hall in 88 I think and Im sad that “perhaps” I will not be seeing him again. OK. Maybe we could knock Marianne on the head now, folks? I’ve checked, and he sang Waiting for the Miracle. Maybe I’ll edit it, or maybe I won’t. It doesn’t really matter. It’s funny that you mention him repeatedly referring to the audience as “my friends”. After hearing it once or twice I thought about how that phrase has become John McCain’s refrain and how utterly creepy and false it is when he says it. But every time Cohen said it, I didn’t just think he meant it – I was certain. I have to say that his live renditions of his work from The Future and I’m Your Man were far better than the album versions – I think there’s a lot about the 80s / early 90s production on both of those albums that hinders the fantastic songs that lie beneath. Then again, his live renditions of every song was better than the album versions. The whole thing was a million times better than I could have ever hoped. I’m not sure what you mean by saying that he sang Buckley’s version of Hallelujah, though, he sang his own version (with all the verses!) that I think is far superior to any cover out there. Was chuffed to catch ‘… Marianne’ on Sunday too – was equally chuffed that he covered pretty much every album with a setlist that was clearly well planned and constructed. 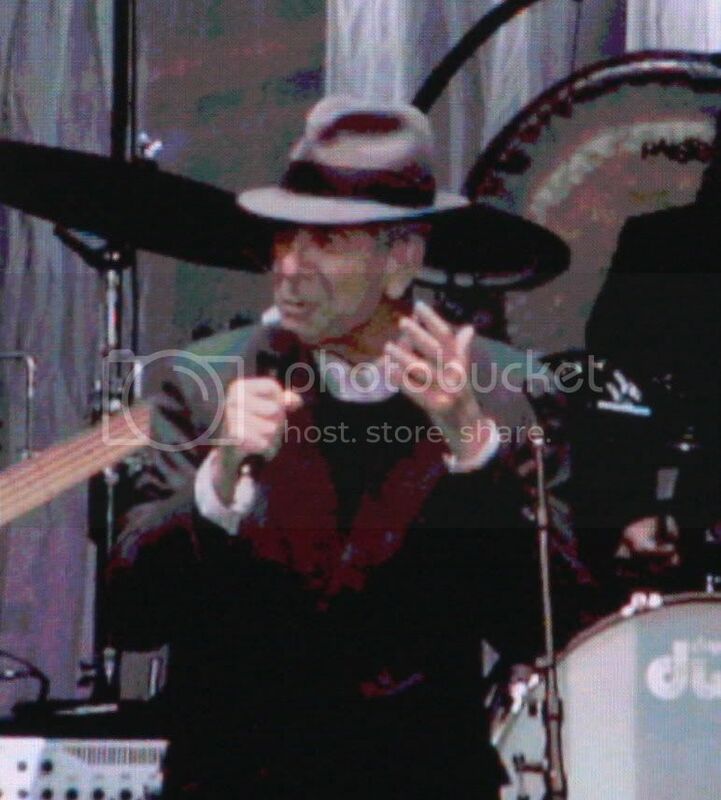 Leonard Cohen is the epitome of old-fashioned courtesy and genuine warmth. He can’t disguise it. In that, he’s the absolute antithesis of phony political baby-kissers and a living rebuke to the boorish society we’ve evolved into. He did the version that Jeff Buckley made popular. I just personally happen to prefer the version on Various Positions. Leonard didn’t sing it with all the verses though, and neither did Buckley. I believe he might have had as many as 80 to choose from before finally deciding which ones to include in the album version. One of the best gig reviews i’ve read in a long time. I dunno how you feel about Jazz but if you are interested i wrote a little bit about a musician i really loved and admired that passed away this weekend. I’m not much into jazz, but I’d say our colleague Mr Darwin might be interested. I sent him the link. Oh I see what you mean about it now. I can’t actually remember what exact verses he sang (was sure there was one that wasn’t sung by Buckley) – that’s despite singing along to the whole thing. Didn’t bother me one bit even if it was a word-for-word copy of Buckley’s cover, to be honest. It’s such a fantastic song and the composition he uses, with the big and beautiful chorus, makes it so much more of a song than Buckley’s version – which I have to say I do like somewhat but in a very different way and for very different reasons. Sorry to be contrary here but Hallelujah wouldn’t make my top twenty Cohen songs and Buckley’s version wouldn’t make my top twenty Cohen covers. It isn’t that it’s that bad. But. For one thing it’s been done to death but mostly it tickles taste buds which are the opposite of the ones my favorite Leonard Cohen songs hit. What do you think? You’re entitled to be contrary if you want. Look how grumpy I am! I have to say I do like Cohen singing Hallelujah, even though the song has been done to death as you say. In fact, it’s in danger of becoming the new Boxer. Everyone’s personal preference is different, but in my case the taste buds it tickles are pure Cohen. Rave review in yesterday’s Indo, same gig. Nearly as good as yours ! Best concert review I’ve ever read. Excellent. Great review of an amazing man. As a long time fan I am gutted that my procrastinating gene saw to it that I missed the gigs…how foolish I ? Your reverential account of ‘The Appearance’ has only added to my regret, the event as you so well described it sounds epic! When I gave up CDs almost 20 years ago now, the hardest one of the dozen to give away was my Cohen one. But now it feels like you’ve given it back to me Bock. Thanks. Hi to all what a night the best ever. 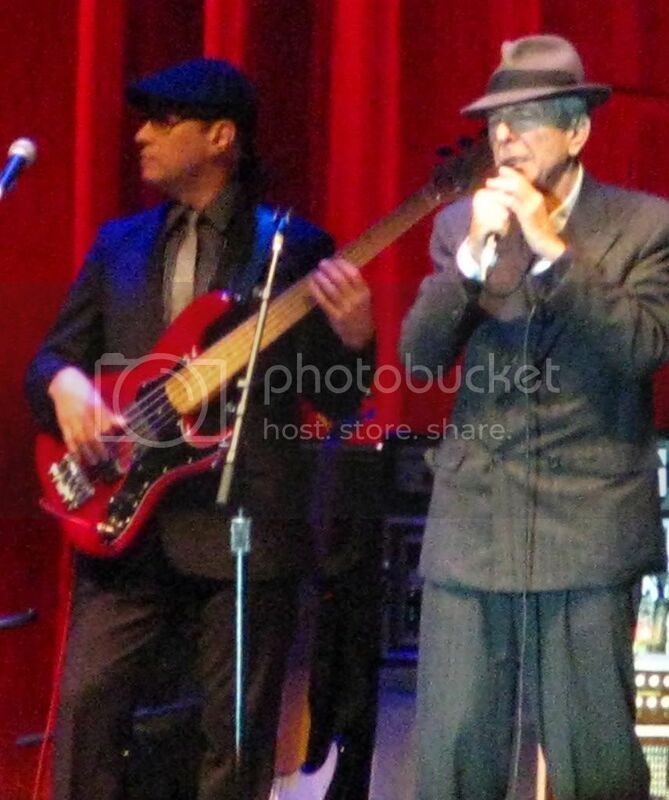 Mr. Cohen did not sing Marianne on Friday night or on Saturday but he Did sing it on Sunday night. What a gentleman what a gentle man. That was one of the nicest pieces of reading material I have read in a long time. You know what I think, Elaine? I think he sang Marianne in our hearts. Thank you for your review very much. I will try to attend his concert in Prague in August. Dang, he sang ‘Hey, that’s no way to say goodbye’ in Manchester… ah well. Nothing can take an iota of joy away from my experience there. Not one iota. That would have made a perfect night perfecter!! I was there at all three concerts and am off to see him in Edinburgh next month. Each night was equally wonderful. What an utter joy Cohen is to watch and listen to. He only sang Marianne on Sunday – he must have read some of the earlier reviews, where it’s absence was much remarked upon. There will always be songs that we would love to hear – it’s hard to cover nigh on 50 years in 3 glorious hours. I would love to have heard “Chelsea Hotel No 2” – but its absence did not in any way diminish my total joy at being at each gig. It was really moving, too, to hear him sing “Democracy”, considering the current race for President. It will always be a cherished memory of mine to have heard him sing that song live, while the first black candidate is doing well in that race. Bock, that is one wonderful review. Well, well done! I look forward to reading more reviews from you. Thank you. 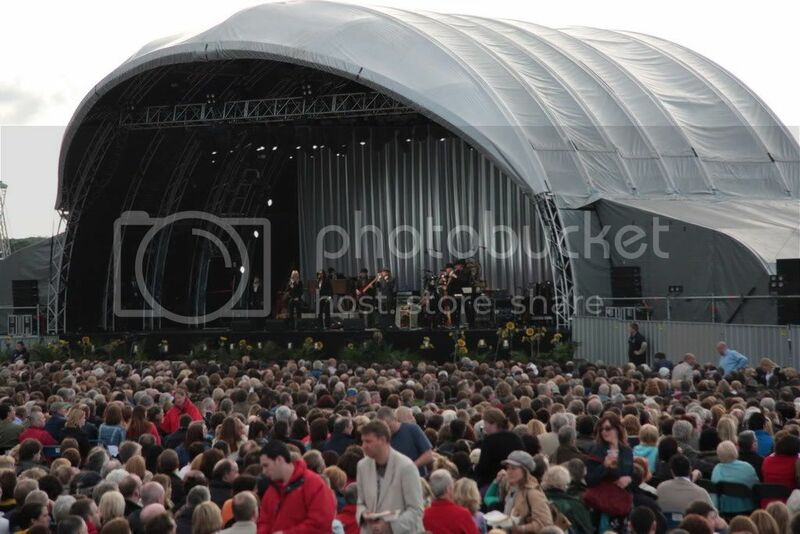 If John Lennon and George Harrison came back from the dead, teamed up with Paul and Ringo and played a concert in a stadium with Elvis opening for them, it couldn’t, for me have held a candle to the Friday 13th gig in the grounds of the Royal Hospital in Kilmainam in Dublin. When I first listened to The Rock Machine Turns You On and heard Cohen sing, All the Sisters of Mercy they are not departed or gone, I was hooked. I was sixteen and wanted to sing like that or even just sing. I knew nothing about Cohen, information was much harder to come by when there was no Internet. Many years later, I turned to these songs in times of confusion and found a lot of answers in his writing sometimes to questions I wasn’t even asking. I met him in a dream sitting in his car waiting for Mrs. Cohen to finish the supermarket shop and as we were both killing time, even felt free to ask him the burning question about Famous Blue Raincoat. He did play in Ireland, at least once before it passed me by as a was a full-time student running my business in my spare time to support my three children and pay the rent so concerts were out of the question and I didn’t even want to know what gigs I was missing, never mind getting to go to them. When I heard he was playing in Dublin this year, I didn’t do anything about booking as somewhere in my mind, the guy meant so much to me that he could only disappoint – something about meeting your heroes. I’d buy some records instead. In the most unlikely circumstance, I was told, on Thursday that there was a possibility of a spare ticket being available for the Friday concert and was asked if I would go. On Friday it was confirmed and so I did. Stadium gigs usually leave me feeling a bit unfulfilled the crowd who want to be there so they can say they were at the gig of the year, can make it almost impossible to enjoy the music. This was different. 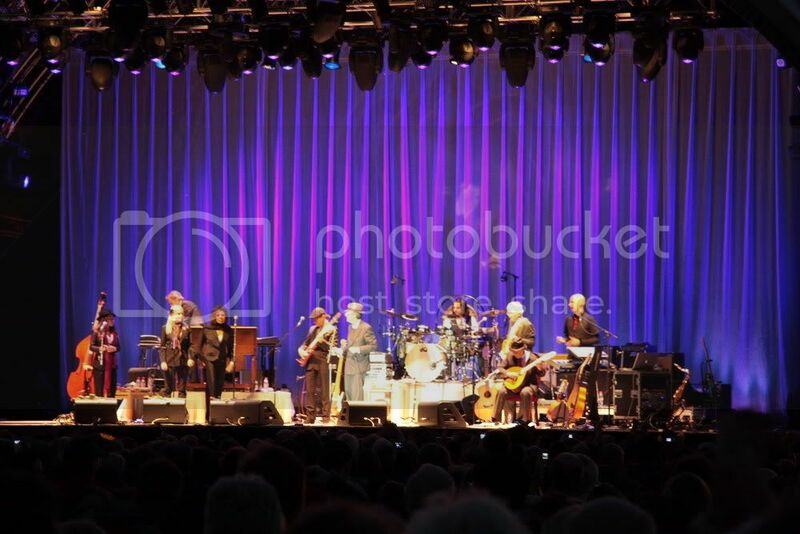 From the minute Leonard Cohen walked on to the stage, this was a special night. While the stage itself was a speck in the distance, the large screen brought an intimacy I’ve never experienced compliments to the camera crew on an excellent job. On stage, nothing was rushed or even, music aside, seemed rehearsed. 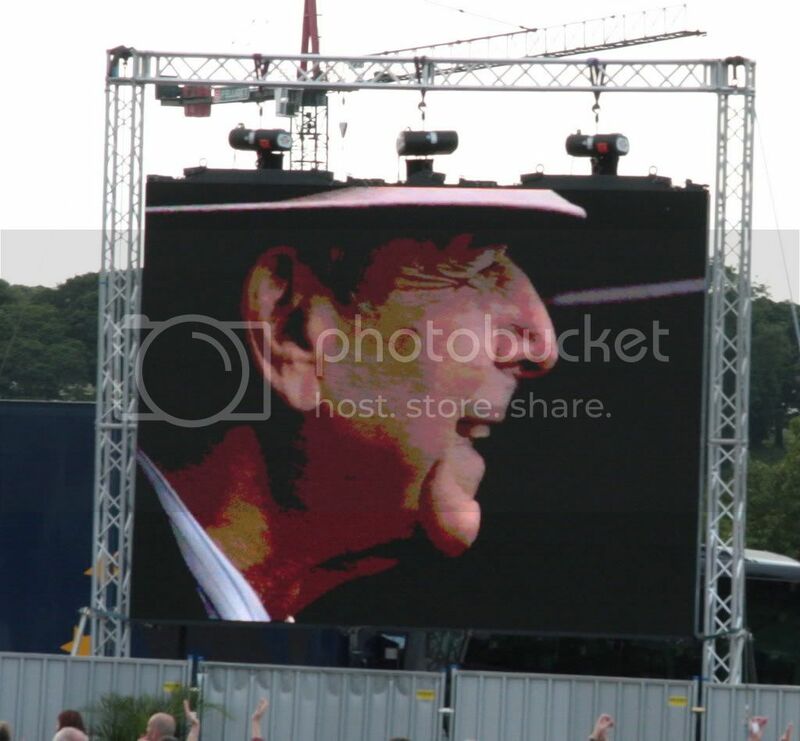 It was as if Leonard Cohen had come to see us. His happiness radiated form every fibre of him. His appreciation of the audience, of his musicians, singers, the beautiful location and even the moon was just about matched by the band’s obvious love and respect for this man a legend but also very much just a man. It was as if everything was awe-inspiring and everyone was beautifully in awe. Respect abounded. Cohen took his hat off literally to the individual members of the band and gave the stage to each for their solo contributions and then just came right back in as one of the guys when it was his turn. I realize I’m doing a poor job at saying what I wanted to say and if, as I planned to, I’d written this right after the gig I might have been able to express much better all that I felt but, as usual, life got in the way and rapture light is the best I can do. When I began songwriting, asked about my influences, the four people I always mentioned were Leonard Cohen, John Prine, John Irving and Guy Clark. As of last Friday I’ve seen them all – live. *I just had to know if it was about the singer Johnny Ray. I don’t know what part of my sub consciousness that came from but the dream features in track 8 on my Losers & Sinners album. I’ll put it on my Myspace page soon. We were there Saturdays gig. No , he did not do SO LONG MARIANNE. Thanks Pete. We established that, but as I said, it doesn’t really matter. Thank you for your excellent review of that wonderful Friday evening, I have never experienced a gig of this quality before it was simply studio quality -rounded off by a superlative performance from the gentle-man himself Leonard. I have been at a few gigs of ‘heroes’ who were quite simply a big disappointment due mainly to age and the attendant vicissitudes of Lord Time. Such was not the case with Leonard to use his own words -simply sublime. Thanks again for taking the time to write your review it is the best I have read to date including those in the newspapers and best wishes -I hope you have the opportunity to review Leonard’s next visit to Ireland!!!! Well we can all live in hope -cant we? Saw him Sat night and before that it was 1993 in a small venue called the Warfield in San francisco (It’s also one of the best concerts I’ve seen). One of the many things that amazed me was how great he still is. As Kevin above said I’ve been to a few gigs where the old people on the stage were pale images of the former stars we loved or were uninterested or both. Leonard Cohen has been the soundtrack to my adult life – I am 60. Having never seen him live, seeing him in Manchester at the intimate Opera House on 19th June was the greatest entertainment experience I have ever had, bar none, and one of the most emotional to boot. He was quite simply stunning; almost unbelievably so. You just kept expecting at least one slip or loss of pace and excellence. None came. I hope a recording or dvd of one of the gigs is made. That alone should rebuild his pension fund (I know how that feels Leonard! ) if there is any justice in the world. And if the world was run by people like LC, then there may well be justice, for the first time. And lets not forget the superb musicians accompanying him. Thanks Leonard for one of the most wonderful and memorable experiences of my life. And a great review Bock – whoever you are! I’m thinking of going to hear him in Prague Castle. What do you reckon? i have the same plan. I was in dublin on 14th. And would love to see him in prague. But they still didnt set date. The last one is postponned and new one was not set. I have never gone to a concert a second time in one tour. If I enjoyed the concert I am afraid I will spoil the memory by going again and or start to find faults I didn’t spot the first time. I never did it either. I can’t add to the praise of Bock’s review and the gig itself, everyone’s already said it. However, I’m not sure anyone’s mentioned how much he rehearsed. We flew to Dublin from Glasgow for the concert on the 13th, as we’re on holiday when he plays Edinburgh Castle next month. We stayed in the hotel over the road, and on Friday after we arrived we strolled over to the hospital grounds to wander round the gardens. 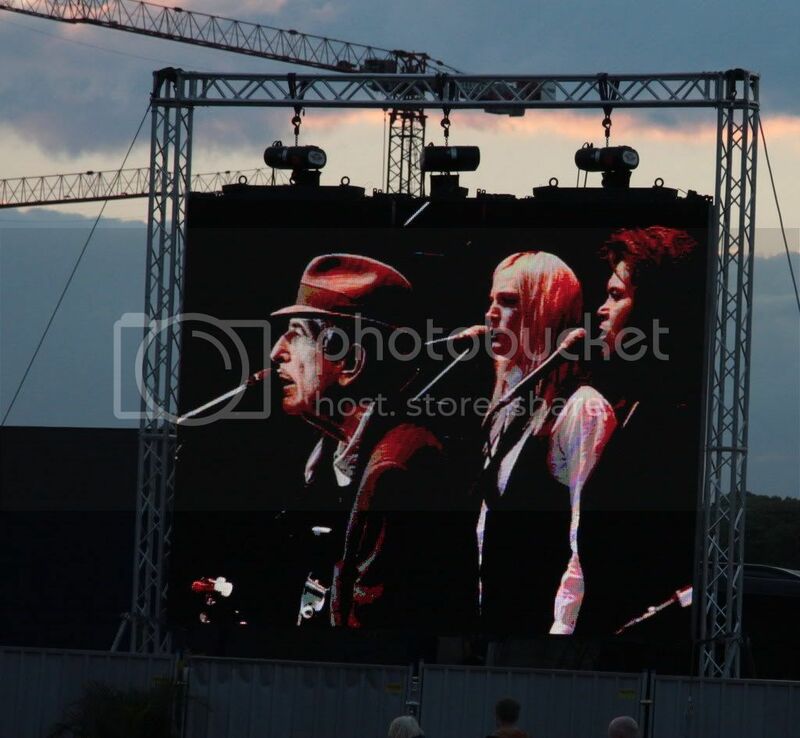 As we walked past the concert site, the screens burst into life and there he was. So we had the added bonus of watching him rehearse. On the Sunday afternoon before we went home we went back to visit the art gallery and I said to my husband that he probably wouldn’t need to rehearse again as he’d done two concerts now, but when we were in the gallery we heard him start to sing So long, Marianne and rushed out to watch and listen again. So although we didn’t get it on Friday night, we made up for it – he stopped and started several times because he “got something wrong”. What a work ethic, what perfectionism. I hope I have that amount of stamina when I’m 73, though I also hope I’m not still expending it on my job! A truly magical weekend. …can’t wait to the Copenhagen Concert. What a review ! As been there yourself. Was a brilliant show. Was just wondering, does anyone know what the size of the crowd was? 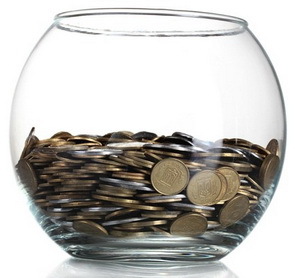 My guesstimate is about 6000. Might that be right? Sunday 15th June 2008, Royal Kilmainham Hospital, Dublin. Father’s Day. The Day The Earth Stood Still. A film title from the 1950’s and the day I finally got to see the legend that is Leonard Cohen. I waited 30 years for this day and wasn’t disappointed. Sublime doesn’t start to describe the experience. The voice mellow and liquid honey: the lyrics so clear and full of angst and warmth and humour. A scene shared over 3 nights by 1000s of the entranced, oblivious to all but the siren on stage. The downpour that accompanied the appearance on Sunday night did not dampen the enthusiasm or detract from the spellbinding power of this songwriting, poetic, lyrical magician. At one point I asked a lady beside me if it was the rain or tears that were flowing down her cheeks. both, she replied with faltering voice. This summed up the emotion of the evening. Everyone basked in the glory and memory of the lifetime of songs, no doubt recalling highlights and lowlights from my own existence. Return again Leonard, enchant us all once more. Next time though, you’ll need a bigger stadium. The word is out. Sorry Bock I am not trying to derail the thread but I can’t find anohter way of introducing this subject to your site. Another great icon of our youth played this weekend in Dublin and Cork. A great debate is raging (in my kitchen at least). Was he brilliant or boring. Well done on winning Blog Post of the Month for this epic piece! Well done on the blog post award – well deserved! hi Bock, congrats on winning the post of the month. Drop me an email with your address + details of when you’ll be home and I’ll get the phone prize over to you early next week. same here – we saw him on july 12 in amsterdam, easily one of the greatest, most touching concerts i’ve ever seen. will go again on oct. 4 in berlin. see ya, lenny! Wonderful review. I was there that night also. Leonard, you are timeless, your work never ages! I saw Cohen in his first concert in Dublin in 1972 & every time he performed here since But this visit was just fantastic. Looking forward to the next one. What a great concert review. Well done. We just found out that Lenny will be in Australia early next year, and have managed to get tickets for the Melbourne concert. This will be the highlight of my life. 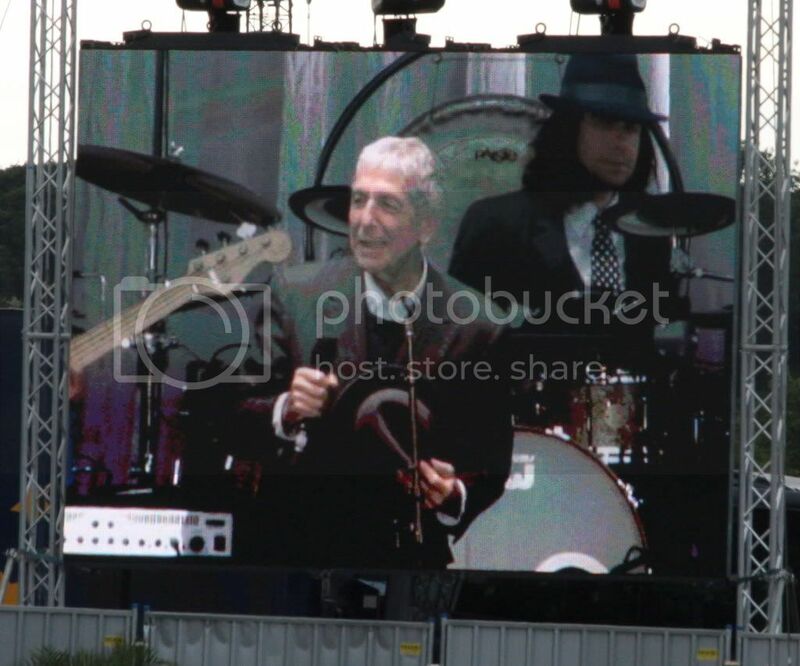 We are indeed privileged to be alive at the same time as Leonard Cohen…………. We went to the London O2 Arena concert last night and It was almost idenical to what you’ve described for the Dublin concert. Awesome! BTW his patter and jokes were identical to Dublin but so what. And best of all? I have managed to get tickets for tomorrow night at Brighton – and at face value! Not sure how much I would have been prepared to pay (check ebay and weep) but this is genuinely ‘concert of a lifetime’ territory – in several ways. Two days now and you haven’t slammed the X Factor f*ckwits for covering Hallelujah! TWO days. C’mon. I have successfully avoided seeing or hearing anything about X-factor until today, when somebody informed me that the idiots were abusing Lenny’s fine song. It’s appalling, but what are we to do? Thank you for this beautiful post on my hero. I’m an old lady who grew up in Montreal, where he first lived and performed. As a young girl, I cried hearing him sing Susanne. And I never let him go…He had a magnetic presence. He sang, and he wrote with his heart. And he gave you his heart. Through the years, he has reached even more depth and emotion. He is a gift from the Heavens. May you be blessed for speaking so well of him, and for appreciating the richness of his offerings. Thank you Claudia. It’s very kind of you. Reflecting back on 2008, am only getting around to reading your review. Thank you so much. You brought me right back to the gig to beat all gigs on Saturday 14th June when I was utterly blissed out by the gentleman poet, my hero, Leonard. Having discovered Cohen at the end of the 60s while living in Paris, his was one of three LPs I played incessantly and his lines became part of my philosophy of life. What a privilege to have been at the concert, accompanied by my 28 year old son who was equally as enthralled as I was. No generation gap with Lenny. Again, thanks for the wonderful memories with your excellent review. I wonder if John Reynolds could encourage a return gig in 2009!!! 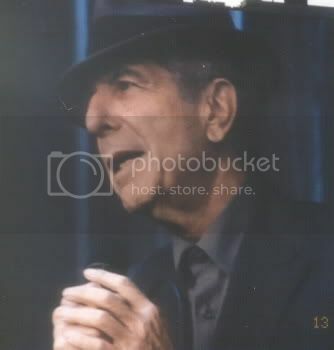 I am a 63 year old Australian who saw Leonard (my hero since I first heard him in 1970), and, on Tuesday night, with the love of my wife, Margaret, and son Tim, we went to his Brisbane concert.It was all that you wrote, and more. Here he sang Marianne, but not Closing Time, and he finished with a Biblica adaption of ‘Whither Goest Thou’. He was on stage for three hours!!! Just discovered this review…..speechless!!! 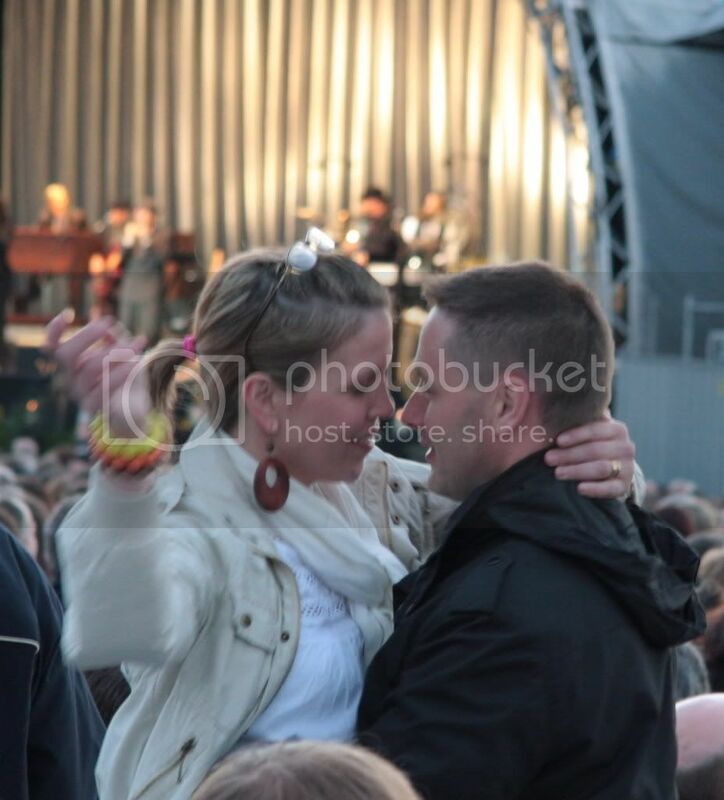 Took me right back to Sunday 15th June Royal Kilmainham……after a wait of 40 years! You told it as it was. That wet (did’nt matter) night you knew you were in the presence of someone/something very special. Secured my tickets this morning for the ’02’ 19th July. Lord, hasten the countdown. Thank you again for this masterpice review. Love the review. At the store today, I found Cohen’s Live in London, recorded July 17th 2008. The track listing goes right along with your review, great double album. I can’t imagine what it would be like to have been there, the man can absolutely captive his audience. 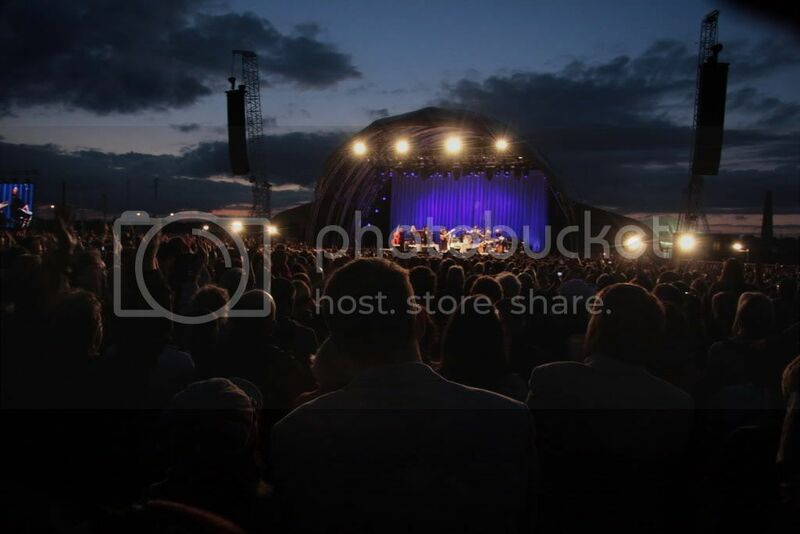 We travelled from Ireland to see him in concert in London on 17 July last year…. turns out this was the concert recorded for the DVD. Beyond the performances, what I admired the most was the fact that he thanked the fans for keeping his music alive. That simple recognition spoke volumes. But she was wearing something tight! Val, have you awoken from a very long sleep? The fabelous leonard cohen,we followed him for 35 years,and loved him,but were left traumatised after the lissadell concert, where i brought my disabeled elderly mother and my 7 year old daughter.They had insufficent wheelchair access and facilities,when i tried to take a photo of leonard i was set upon by a OBNIXOUS burley bouncer that thought he was at oxygen controlling teenagers…..i told him to leave us alone and he began roaring like an animal at us,my daughter was roaring crying at this stage after being terrorised ,i demanded that he go away,but he brought back more heavies,who continued to be abusive even though my daughter was screaming crying.My mother wanted to leave but couldnt as she needed wheelchair assistance.I then saw him roaring at another woman and pointing his finger in her face,,,giving her dogs abuse as well.The badge and power trip must have gone to his head for the day,i got his badge number and complained to the guards, who could do nothing,but told me to report him.We drove 4 hours to the concert,were verbally abused by staff,then left out in the rain till 1am,to get wheelchair assistance back to the car park.It was ment to be a lovely evening for 3 generations of ladies together ,out at a concert as a treat.And it was destroyed, riuned, and left my daughter traumitised.I want answers!Iwant an appology!! !And i want my ticket money refunded! !And i want a geisture of good will made to my daughter!!!! !What a disgrace of an evening!!!!!!! !